Charles Campbell, the Lloyd E. and Florence M. West Endowed Professor of Chemistry, has been elected as a Fellow of the American Association for the Advancement of Science (AAAS). AAAS recognizes Fellows for their contributions to science and technology. Professor Campbell is one of two newly-elected Fellows from the University of Washington. Read the full list of elected AAAS Fellows. 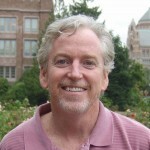 For more information about Charles Campbell and his research, please visit his faculty page and research group website.